With its stone and stucco exterior, arched windows, and grand entry, this home's graceful appearance merely hints at the treasures that await inside. 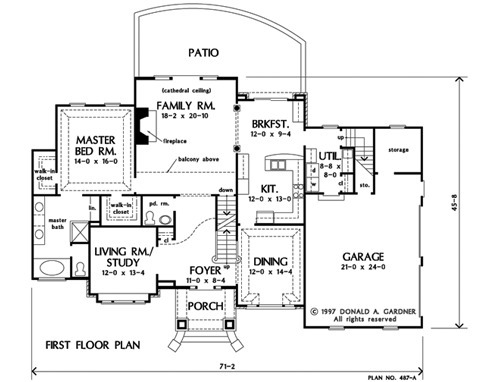 The two-story foyer makes a formal invitation into a living room/study with box bay window seat, a dining room with elegant tray ceiling, and generous family room with fireplace and cathedral ceiling. Columns mark the entrance to the breakfast area, open to a spacious kitchen with walk-in pantry. The master suite has a private location on the first floor and includes a tray ceiling, his and her walk-in closets, and spacious bath with linen closet. 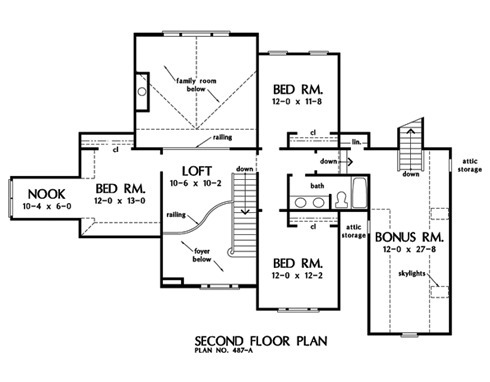 Three more bedrooms are located upstairs along with a full bath and skylit bonus room. 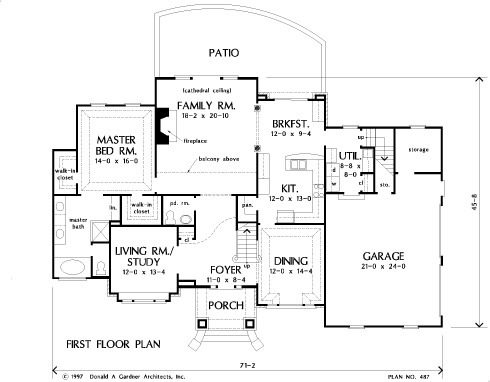 House Dimensions: 71' 2" x 45' 8"
Great Room: 18' 2" x 20' 10"
Bedroom #2 : 12' 0" x 12' 2" x 8' 0"
Bedroom #3 : 12' 0" x 11' 8" x 8' 0"
Bedroom #4 : 12' 0" x 13' 0" x 8' 0"
Bonus Room (Vaulted): 12' 0" x 27' 8" x 8' 0"
Breakfast Room : 12' 0" x 9' 8" x 9' 0"
Deck / Patio : 31' 2" x 11' 0" x 0' 0"
Dining Room (Tray): 12' 0" x 14' 4" x 9' 2"
Foyer (Vaulted): 11' 0" x 8' 4" x 19' 0"
Garage : 21' 0" x 24' 0" x 0' 0"
Garage Storage : 8' 4" x 8' 0" x 0' 0"
Great Room (Cathedral): 18' 2" x 20' 10" x 19' 0"
Loft / Study : 10' 8" x 13' 0" x 9' 0"
Master Bedroom (Tray): 14' 0" x 16' 0" x 9' 2"
Porch - Front : 11' 0" x 7' 9" x 0' 0"
Storage (Other) : 3' 4" x 7' 6" x 0' 0"
Utility Room : 8' 8" x 8' 0" x 8' 0"